Premium quality 150Amp air-cooled TIG complete torch 17FV gas valve flexible head body package for Miller TIG welders with 25-foot rubber power cable (1-Piece style). With free gift (welding gloves or welding goggle or welding glasses). Free gift may vary upon availability. Premium quality 150Amp air-cooled complete TIG welding torch 17FV gas valve flexible head body package for Miller welders with 25-ft rubber power cable (1-Piece style). 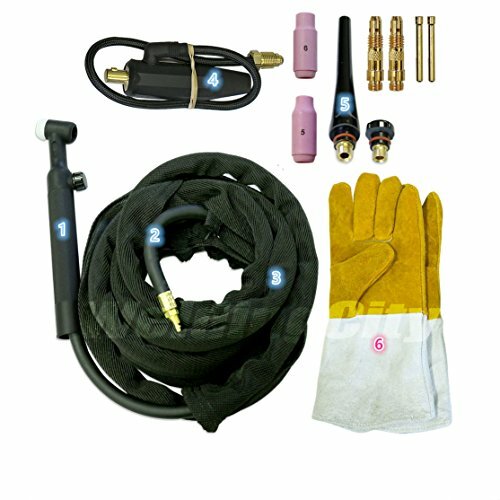 Package includes: WP-17FV flexible with gas-valve head body with handle; rubber power cable hose 57Y03R 25-foot; Nylon cable cover with zipper 24-foot; power cable adapter for Miller TIG welder (Miller P/N 195378); accessory kit and free gift. Use standard Weldcraft/Miller style TIG consumables and parts. Connection adapter is 1/2" twist connector (Miller P/N 195378). Work with 57Y01R/57Y03R 1-piece power cable. Ideal replacement torch for some models of Miller welder Dynasty Maxstar Syncrowave Syncrowave CST XMT. See all listed pictures for torch parts and rear plug adapter. CHECK YOUR TIG WELDER FOR MATCHING. Free gift may vary upon availability (14" leather welding gloves or welding goggle or welding glasses, etc.) Free and Fast Shipping within the US. View More In Welding Equipment & Accessories. If you have any questions about this product by WeldingCity, contact us by completing and submitting the form below. If you are looking for a specif part number, please include it with your message.